I’ve only recently started eating greens like Kale, Chard, and Escarole. They aren’t readily available in my market where I live and they aren’t something I’ve picked up when I’m out of town shopping. This past summer my brother was telling me how wonderful kale was and gave me his recipe for Quinoa, Spinach, and Kale Lasagna. Now there were two problems with this recipe. One is that I’ve never cooked kale and the other is that I never cooked quinoa. It turns out I like both a lot and really enjoyed this dish. Since then I’ve been buying greens whenever I can and sneaking them into our meals. When the fabulous people at Cut ‘n Clean Greens offered to send me a box of greens to cook with I was pumped. 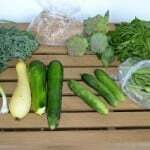 As I said before we can’t get many of these greens here in town so it was a pleasure to receive a box of fresh greens in the mail. I already had several recipes I wanted to make including a soup and a chicken dish but I wanted to make something more creative. I was really looking to make a baked good but that seemed out of the question. 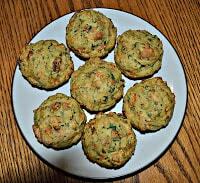 Then I started thinking about other vegetables I use in my baking and came up with zucchini and carrots. That’s when the idea hit me to try a carrot cake muffin with kale in it. I’ll be honest and say that I was a little worried about how they would turn out. I used some extra spices to give the muffins a wonderful flavor. 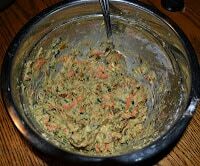 I chopped up the kale into small pieces and added them along with the carrots. When they came out of the oven they smelled wonderful but they didn’t look great. 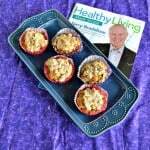 The orange and green flecks in the muffins made them look more like a savory muffin then a sweet muffin but I gave them the benefit of the doubt. I’m so glad I did! 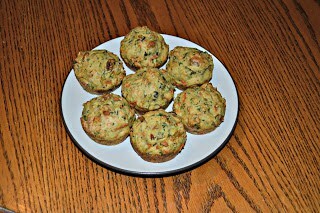 They were delicious and filled with all the benefits of carrots and kale. 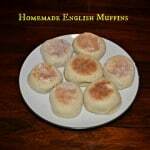 The muffins taste of spices, raisins, and have a hint of the vegetables but it’s a wonderful combination. I’ve been having 1 or 2 for breakfast ever since I made them and I feel good knowing that they are good for me. I can’t wait to take some to my brother, who loves kale, so he can try them too! 1. Preheat the oven to 400 degrees. Spray a muffin tin with cooking spray and set aside. 2. In a large bowl combine the flour, baking soda, baking powder, cinnamon, nutmeg, and ginger. Mix well and set aside. 3. In a medium mixing bowl cream the brown sugar and butter. Add in the Greek yogurt and mix well. Stir in the egg and vanilla. 4. Pour the yogurt mixture into the flour mixture and mix well. The mixture will be dry and crumbly. 5. Stir in the carrots, kale, raisins, and orange zest. Mix until just combined. 6. Spoon the mixture into the muffin tin filling each cup 2/3 of the way full. 7. 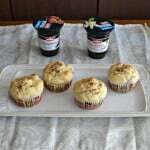 Bake for 15-18 minutes or until the tops are turning gold and a toothpick inserted into the muffin comes out clean. 8. Let cool for 5 minutes before removing the muffins from the tin and cooling completely on a wire rack. 9. Store in an air tight container for up to 5 days. Do you think that I could substitute the flour for almond flour?